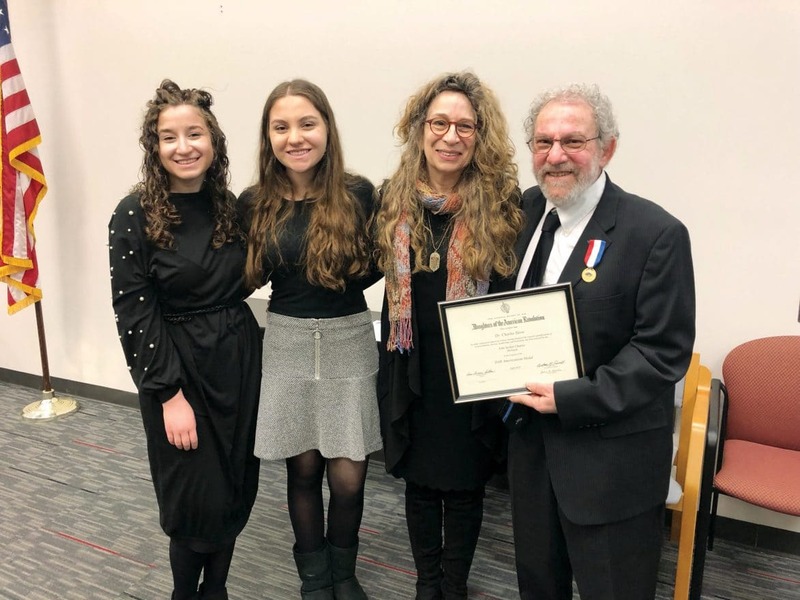 On Sunday, March 24, 2019, at the Holocaust Memorial Center in Farmington Hills, Michigan, the Daughters of the American Revolution (DAR) gave me their “Americanism Medal” for naturalized citizens who have contributed to America. I was very touched and accepted this award on behalf of our Holocaust Survivor community here in Detroit. I thought that it was significant that the Daughters of the American Revolution would give such an award to a representative of the Holocaust survivor community. You may know me as the secretary of the World Federation of Jewish Child Survivors of the Holocaust and Descendants (WFJCSHD). Professionally, I’m the director of the Program for Holocaust Survivors and Families of Jewish Senior Life in Detroit. We offer support groups for Holocaust Survivors and children of Survivors, we have a monthly Cafe Europa program, an oral history project called Portraits of Honor, portraitsofhonor.org, and enrichment programs all designed to help Survivors know that they are not alone. I’m also involved with our local Second Generation organization called C.H.A.I.M.-Children of Holocaust-Survivors Association In Michigan. We often talk about the importance of Holocaust education and of the awareness of respect and tolerance for all peoples. By giving this award the DAR, this most American of institutions, recognized how the Holocaust Survivor community has contributed to the fabric of American life. In granting this award to our community, the DAR is recognizing the importance of the teaching of morality and of the ensuing tragic results of the evils of Antisemitism, and of hatred and bigotry in general. To me, the DAR represents the spirit of freedom from tyranny and the incredible experiment in democracy that resulted from the American revolution. Indeed, after the Holocaust, America opened its doors to the new immigrants who sought to make a new life in a new land that represented freedom from Antisemitism and freedom from tyranny. In bestowing this award to our community, the DAR showed its respect for Holocaust Survivors, to America’s immigrants in general and their contributions to the tapestry that is the greatness of America.